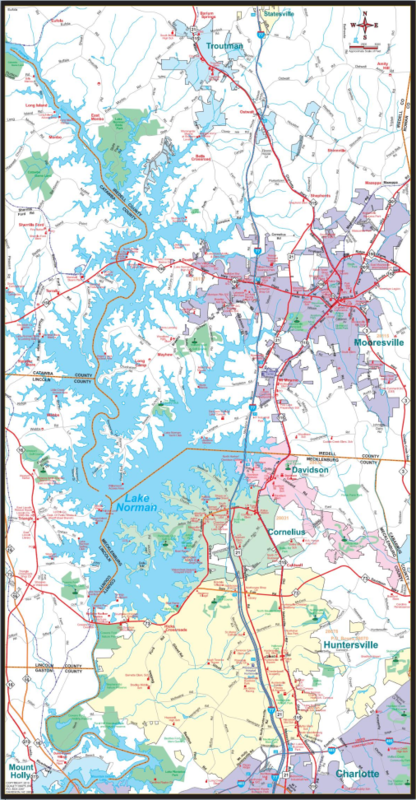 Originally formed in 1963 by Duke Power, Lake Norman is named for Norman Atwater Locke, a retired Duke Power president. The largest man-made body of water in NC, it measures 34 miles long, 9 miles wide and meanders along 520 miles of shoreline, bordering 4 separate counties! Once only a weekend destination, Lake Norman has grown into a resort area attracting residents and retirees looking to enjoy the full-time lake life in a mild four-season climate. Best viewed from a boat on the water, several marinas dot the shoreline, providing boat rentals, launch ramps, boat slips, and of course, gas stops for refueling. The unique shape of Lake Norman makes it a water sports paradise with activities to suit everyone. Hundreds of smaller coves are perfect for fishing or kayaking, while long main channels suit wake boarding, jet skiing or sailing. Soak in the lake rays and vibe from one of many waterfront restaurants from dive bars, to fine dining. Public parks and Boat Launch areas offer access to those without a private dock. Lake Norman State Park in Troutman features over 30 miles of mountain biking trails, a 125-yard waterfront swimming beach, boat ramp and fishing opportunities along park trails. A 32-site family campground is also available during warm-weather months. Lake Norman attracts anglers from all over who participate in fishing tournaments, or spend the day pursuing monster catfish, crappie, striped bass, largemouth bass, yellow and white perch that reside in the lake. Along Lake Norman’s beautiful shores you’ll find charming towns rich in cultural and community events. Your lifestyle leads your ideal home location here. The southern end of the lake at only 15 miles from Uptown Charlotte, suits those who desire to be close to the big city. The west side offers a quiet side with a “small town” feeling, while the east side offers shopping and entertainment opportunities. The north end of the lake enjoys less development, not unheard of to see cattle wading in the water! Some of NC’s most prime real estate is found on Lake Norman. Homes range from traditional lake cabins to spacious, window-wrapped mansions. Waterfront communities with resort style amenities are found here, as well as homes located in non-HOA areas – it’s yours to choose! The 4 counties represented are Mecklenburg, Iredell, Catawba & Lincoln. Towns with waterfrontage include Cornelius, Davidson, Mooresville, Troutman, Sherrills Ford, Denver, Huntersville & Statesville. Mild weather, lake recreation, and close proximity to professional sports teams, music arenas and cultural offerings of the Charlotte area make Lake Norman an attractive place to call home for years to come!